I just arrived in the city state of Pensar this morning. This area used to be a part of Akan’s Reach, but that empire fell two years ago. I arrived just in time to watch the “Festival of the Lost” parade down the main street of Pensar. As I was watching I saw an assassin shoot down the emperor right in the middle of the parade. I chased down the assassin and captured him. (It seems like I find trouble everywhere I go.) There were some other assassins as well, and I helped capture them, along with a few others I met. Along with the Pansar guards, we took the assassins to emperor’s building. It seems that the assassins were sent by Empire of Umbria, just to the north. They asked us to undertake a mission. (And you know I can never pass up a mission.) We are to travel to Fort Guardian in Umbria and join their militia in order to learn their intentions. I doubt I will have much time to practice my drumming, since I’m trying to maintain a low profile. 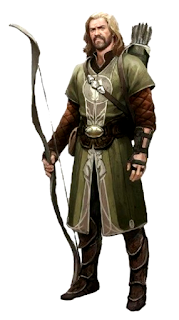 I’m hoping I can make enough money to buy a nice longbow. I really need the practice. I’m writing to you to keep up with my calligraphy. Obviously I won’t be able to show you this until I come back home. Traveling with me are Dragart Bretentious, a human knight, Maric Pulsivius, a half-elven sorcerer, and Lia Xiloscient, an elven ranger. They are on add bunch, but formidable allies. Dragart wavers between pompous and overly apologetic. He’s overly inquisitive and rigid about personal things. Somethings are the same the everywhere. Maric wavers between practically everything. He is quick to act, but not as quick to think. Lia, is probably my favorite. She is quiet, but competent. We reached Fort Guardian. On the way we only encountered minor trouble. Some rebels in the woods let their pet wolf off the leash and it tried to attack our horses. They were upset that we put it down. Fortunately things did not escalate. In Fort Guardian we met with our contact, John of Beverley. He led us into the fort and had us settle in.